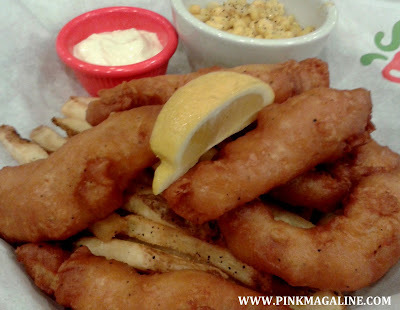 This rainy day is making me think of nothing else but food and eating. Can't go out yet so I am posting about my family's newest food discovery while still holding my patience over this wet gloomy weather-- Chili's at SM Megamall. Chili's is an American restaurant that offers Texan-Mexican cuisine. Our feet lead us to their branch at the Atrium after hubby noticed their ad at Mega B one day. Btw, excuse the quality of photos 'cause they were taken using my camera phone. Texas Cheese Poppers at P325 is a perfect choice for an appetizer. My eldest daughter who is a huge fan of anything with cheese loves this finger food so much. It is crunchy on the outside, then soft and chewy inside. 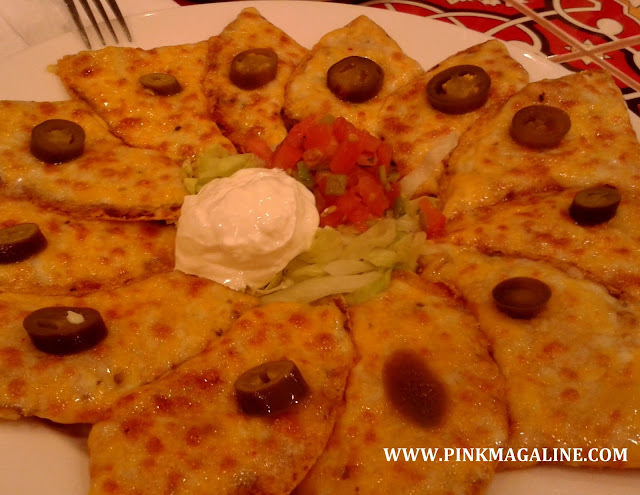 A plate of Classic Nachos good for 3 to 4 people is P435. I got ours for free. Thank you very much to the manager who came to our table and gave us a coupon the first time we dined there. These nachos are the yummiest ever. This one is called Big Mouth Burger Bites at P420. 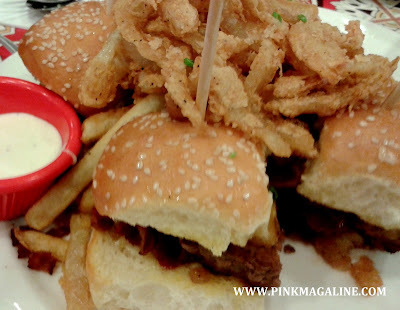 It is composed of 4 mouth-watering mini burgers served with potato fries and onion rings. This is another big plate so better share it with other 2 to 4 people. What I ordered to satisfy a gestational craving was this Country-style Pork Belly for P425. Too bad Chili's don't have plain rice. I could've enjoyed this better if they gave me steamed rice instead of that yellow rice on the side. Lastly, I have here hubby's favorite which is called Blackened Fish Fillet P395. I don't remember the exact definition of this dish tho. I think it was like fish fillet with spices and herbs served with black beans and cajun rice. My elder daughter coloring and doodling while waiting for the food to be served, using the paper and crayons that a Chili's waiter provided. Family-friendly huh, something that I really like from this restaurant. 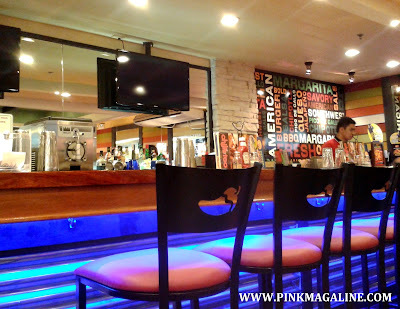 Now for the overall rating of Chili's at SM Megamall, I say this casual dining restaurant definitely deserves an 8.5 over 10! The mood and the crowd at this place are usually nice. The place has a beautiful interior, has enough lighting and clean. The servers are polite and the manager is accommodating. I must admit that their food is a little expensive compared with other American restaurants. However, you (sometimes) don't really mind paying a little more if all you get is excellent taste and service, right? I haven't tried Chili's yet, although I've passed by its branches all the time! XD Will definitely try it out when I crave for Tex-Mex food. :) And yes, I won't miss the nachos! my gosh! am drooling...kakagutom...I'll go for that juicy pork belly...ehehee! i tried eating at this branch and i have to agree that the waiters are really nice and attentive :) i love their pasta btw.